We pivoted. It turns out making a podcast is very tedious work and not many young people will listen to them. Who would've guessed? 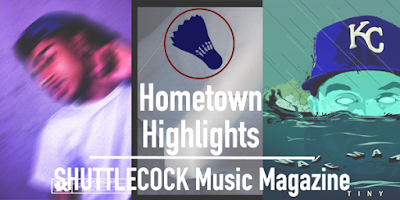 Instead we have decided to offer you new local tracks via a new feature called Hometown Highlights. 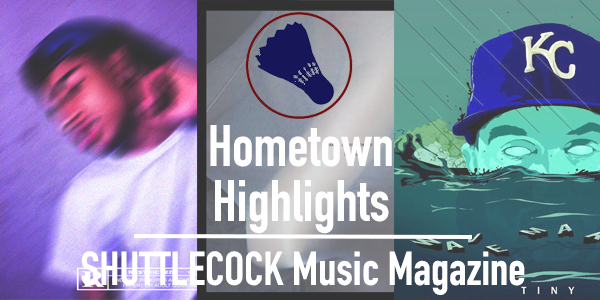 Every couple weeks you can read about and listen to handful of recent songs from Kansas City and Lawrence musicians. Our first edition of HH is packed extra full since it's been a while since the podcast ended. It features new music from a Kansas City's most recent major label signee, a new non-punk band with punk members, and several other tracks from Shuttlecock favorites. Let us know which tracks you enjoy! "Runnat" is the first song released by Kansas City rapper Rory Fresco since signing his deal with Epic Records. The song chronicles his overnight rise to fame and travels to New York after his last single blew up. "Runnat" is full of quotable lines ("I don't want to have to prove a lesson/n****s came out the womb finessin'") and shows that the 18 year old is no longer cool with keeping things "Lowkey." Slowly but surely, every member of the Kompound house is getting their stab at fronting a band. Michael McCullum recently moved to town and immediately began playing bass in Kolumbine Kids. In Windows 95, McCullum and his roommates are writing lo-fi renditions of current emo/pop-punk music with some powerpop soloing thrown into the mix. "Fun" is their debut single, but expect more in the near future. Kyle Plu$ - "God $hit"
Kansas City via Wichita rapper Kyle Plu$ released this "God $hit" a few months back and boy has it been slept on. With only a little over 1,000 listens on SoundCloud, this cloud rap banger with great replay value is begging to be listened to by fans of A$AP Rocky, Future, and others. Eric Griffin Jr. - "Like A Bruise"
The Shuttlecock Showcase alumna dropped two new songs on his SoundCloud a couple weeks ago and he is sounding bolder than ever. On "Like A Bruise" Griffin sings about the perils of falling hopelessly in love over his now-signature choice of a lone electric guitar paired with his voice. Be sure not to miss its partner song "Peach Guts." One of Lawrence's (and Rudy's Pizzeria's) favorite rappers is back with a new single. "NestEgg" features the hippie emcee painting pictures of nature and weed smoke while kindly bragging about being "sharp as a meadowlark." Expect a new release from the Space Camp leader later this year. West Peaks - "Dr. Sam"
A few days ago Intelligent Sound associate and producer Wesley Peak released a pair of new tracks. "Dr. Sam" is one of those new tracks. The beginning of the song features a heavy boom-bap beat that harkens back to '90's New York hip-hop. The jazz sampling throughout the track helps with that as well. Imagine Prodigy and Havoc giving this beat a go. Bath Consolidated is the techno project of Kansas Citian Noelle Johnson. This single is the first to be released from Johnson's upcoming mixtape "Setlist 2," which is out April 30th. "Baobab" is a bouncy cut from the mixtape that features a slowly fluctuating volume level with elements fading in and out. Abrasive tracks from the original "Setlist" make this one seem quite tame, but who's to say what the rest of the release will sound like. Tiny is a Kansas City rapper who released his album "Wave Maker" last month. This smooth and wavy cut features some collaboration with Chicago rapper and crooner Alex Wiley (who made a stop in Kansas City last month with Hippie Sabotage and Kembe X). A nice track for a rainy week in middle America.